The Springbok Sevens team’s sixth place in the Emirates Airline Dubai Sevens on Saturday was one of their worst starts in the HSBC World Rugby Sevens Series in recent seasons, but coach Neil Powell feels there was improvement as the tournament progressed. The Blitzboks claimed victories over Zimbabwe and Samoa on the first day, before a close defeat to Argentina spoiled the afternoon for their fans. They still topped Pool A though, but more disappointment followed early on the second day when they were outplayed by England in the Cup quarter-finals, losing 22-5. The Blitzboks rebounded well to beat Scotland 29-0 in the 5th place semi-final, before losing 24-19 to Fiji in extra time in the 5th place final. Powell said they will be looking to control matches better next weekend at the HSBC Cape Town Sevens. Poor stuff by @Blitzboks – possibly the worst I've seen them play in 3 years. Kickoffs were poor, poor tackling and what is with the high tackles – so many in the first two days. Disappointing start to the series for them. 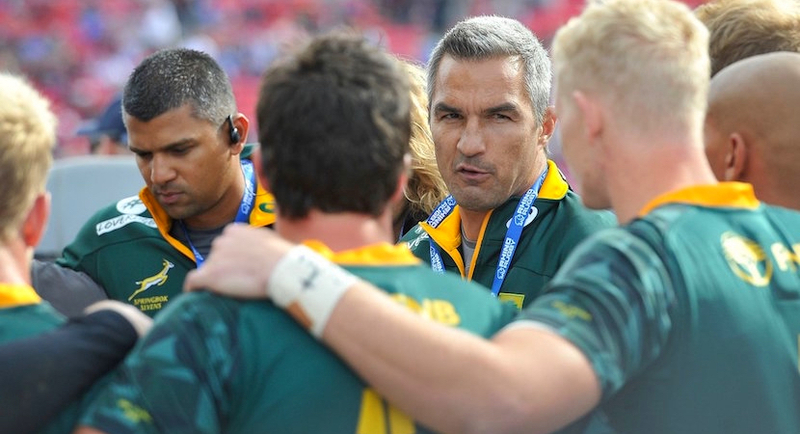 The Blitzboks will be keen to get back home and regroup before next weekend. “We will have great support from fans and family, but it will be our responsibility to improve on our performance. We messed up here in Dubai, so it is our job to fix it in Cape Town,” said Snyman. The Blitzboks failed to fire a shot against England, who scored twice in the first half and then two more before the South Africans could muster a response in their 22-5 win. A brace by England captain, Tim Mitchell, had the English 12-0 ahead at the break and tries by Tom Bowen and Phil Burgess took the game away from the Blitzboks, who only had a try by Selvyn Davids in the last minutes of play to show for their efforts. The Blitzboks though delivered a much better effort against Scotland in the 5th place semi-final, scoring five tries, with Muller du Plessis getting a brace and Werner Kok, Zain Davids and Rosko Specman dotting down as well. Dewald Human kicked two conversions. A hat-trick by Muller du Plessis was not enough to beat Fiji in a pulsating match. The first half was a massive tussle, with defences holding sway. Fiji scored after six minutes of play to take the lead, but Du Plessis scored his first of the match on the buzzer and Dewald Human’s conversion evened out the scores at the break. The second half saw Fiji score a breakaway try, only for Du Plessis to step his way to the try-line for a second time. The young winger then grabbed his third with a minute left to play to put his side up 19-14, but Fiji scored an unconverted try on the buzzer again, resulting in extra time, where they were first to score to clinch the win. The expectation is that all available seats will be sold out when the first match, between Scotland and Canada, kicks off at 10h15. Du Plessis’ efforts were made more special by the fact that South Africa only scored 19 tries in their six matches (the same as New Zealand) to place seventh overall among total team tries. Rosko Specman (3) and Werner Kok (3) were the other main contributors.